"Planet X" was a provisional name given to a theorised large object situated beyond the orbit of Neptune and affecting the orbit of the next planet in, Uranus. 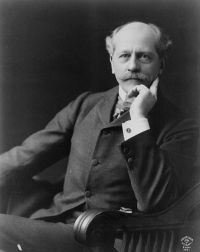 This was way back before the discovery of Pluto and was the brainchild of American astronomer Percival Lowell. This is the chap, you may remember, who proposed the idea that there were artificially created canals on the surface of Mars, indicating the existence of an alien civilization. The subsequent fall-out from this led to his reputation being tarnished. So, in order to redeem himself, in 1906, he began to search for a large planet beyond the orbit of Neptune, to explain the orbital aberrations of Uranus. This he named Planet X, the "X" being a letter rather than a Roman numeral, to indicate "unknown". He conducted his first search along the plane of the Solar System. Thus, he didn't even spot Pluto, whose orbit is inclined out of this plane. In fact, it was completely unsuccessful. Undaunted, he made a new search over the years 1914-1916. Despite still finding nothing, he published a paper estimating his Planet X to be something like half the mass of Neptune, orbiting at nearly 4,000,000,000 miles out from the Sun. He suggested that it would probably be quite large in dimensions, like a gas giant. The theory had, by this time, become an obsession which finally took its toll on Lowell's health, for, in 1916, he died suddenly. The hunt for the planet thus came to an abrupt halt. In keeping with the naming of the other planets (except Earth), the title came from Roman mythology, with the additional nice touch of the first two letters being Lowell's initials. Further observations took place, to see if Pluto's size and mass matched what Lowell had predicted. That is when the problems began. The "planet" was so dim that it must be either very small or extremely non-reflective. If Pluto was large and massive enough to disrupt Uranus's orbit, it would have to have a surface something like the colour of tar. That seemed an unlikely scenario. As if that wasn't enough, the new planet was discovered to have a highly elliptical orbit, causing some astronomers to suggest Pluto wasn't a planet at all, as it behaved more like a comet. The final nail in the coffin concerned Pluto's mass. Over the subsequent decades, this was calculated with ever increasing accuracy - and was continuously being scaled down. In 1931, it was thought to contain the same mass as Earth; 17 years later, it was revised down to one-tenth Earth mass. Then, in the 1970s, it was thought to be as little as one-five hundredth the mass of Earth. This was nowhere near the required mass to alter another planet's orbit, so, unfortunately, Pluto was not Planet X after all. In fact, as you probably know, these days, Pluto hasn't even got full planet status, having been demoted to the category of "dwarf planet". Although various astronomers continued to search for Lowell's theoretical planet, it was never found. Then, in 1989, the NASA space probe Voyager 2 flew past Neptune and was able to make an extremely accurate measurement of its mass. This was found to be less than previously thought. When this new information was used to program a simulation at the Jet Propulsion Laboratory, it was found to account for the irregularities in the orbit of Uranus. This, of course, meant that there was no need for a large planet beyond Neptune's orbit. Today, because of this data, most astronomers believe that Lowell's Planet X does not exist.